Parents are lucky to have literally thousands of sources for college advice. From #Admissions to #FinancialAid, twitter is a great source for parents to get tidbits of data throughout the day. 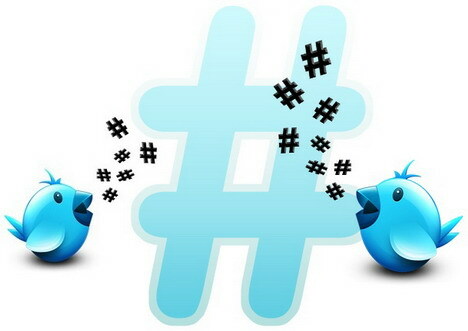 However when your College Bound teen is a junior, it’s time to start watching out for the hash tags #Scholarships/#Scholarship. It’s used to find advice, requests for information, and real aid. But certain feeds truly kick out info on real scholarships on a consistent basis that are often updated and are solid sources for scholarship data. While parents can use scholarship search engines, books, and search locally, seeing the information in a twitter feed can potentially yield some information that could payout for your college bound teen. 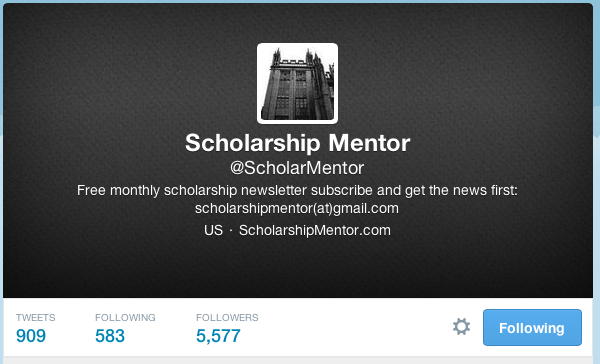 This feed is about 95% tweets of actual scholarships with little retweeting. The links send users right to the sites of the scholarships without filter. Retweets are highly relevant and stay on subject. One of my favorite for just scholarship listings. 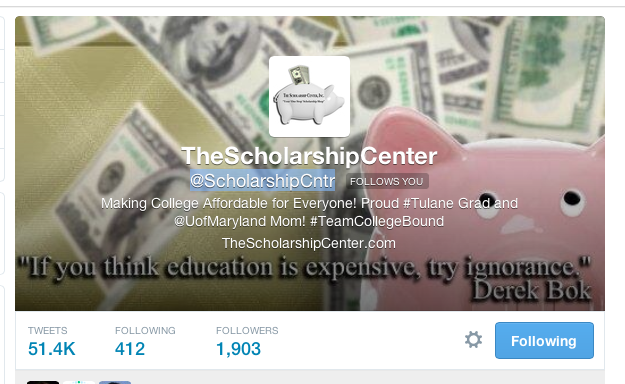 This feed is maintained by a scholarship listing service/search engine TheScholarshipCenter.com. 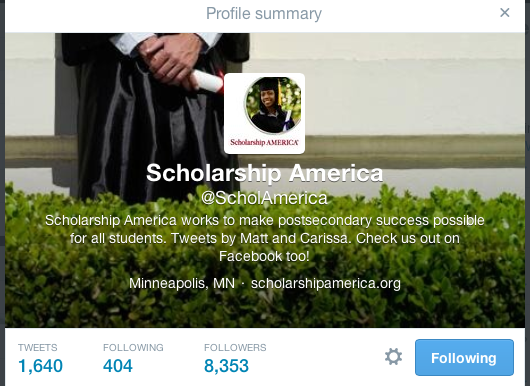 Operated by Scholarship America, this twitter feed is chock full of great scholarship’s and tips as well. Scholarship America also has a huge presence in the scholarship world, as it operates the scholarship programs of many well-known programs. Corporations turn to this organization to help run the entire process, from processing to grading applicants. Their insight is highly relevant and not having this one on your twitter feed is a mistake no parent should make. 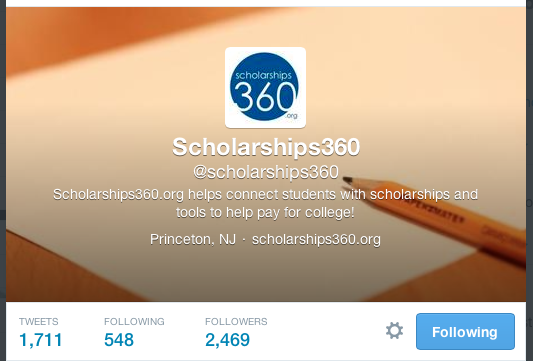 Operated by the Scholarships360.org, a free scholarship search engine service. The tweets usually link to the site. However the links always lead to the description of the scholarship with the links to real scholarship. Highly relevant and easy to use. Operated by a free informational site, ScholarshipMentor.com, the links are relevant and current. Great feed with links tweeted several times a day. This feed is very new, but seems to be dedicated just to listing Military Scholarships for both vets and their families. 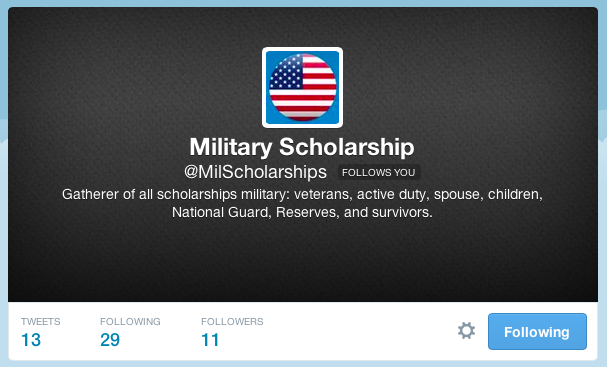 It is attached to the site TheMilitaryScholarshipFinder.com and doesn’t tweet anything except scholarship info. The site itself focuses on the scholarships and I haven’t found any marketing information, so this may just be a volunteer effort. The hunt for financial aid and scholarships shouldn’t end until the last year of college for parents. The hunt should be constant, because the money parents save by finding more outside aid, will save them in the long run over the long-term student and parent loans for college.